There is bicycle parking available at the Concert Hall, near the back of the building on the Museum side. There are regular trains from Scotland's major cities. Perth railway station is located approximately 0.7 miles (1.1km) from the centre of Perth. A map showing the best route to walk can be found here. There is also a taxi rank located outside the station. For information about train times and service updates please visit the ScotRail website or call 0344 811 0344. Perth is easily accessible via all forms of transport. It sits astride the M90, A9, and A85 and due to our central location 90% of Scotland's population can reach our city in 90 minutes or less. There is both on-street and off-street parking on Mill Street where charges apply from 8am - 6pm Monday to Saturday. There are three disabled public car parking spaces directly opposite the main entrance to the concert hall but these tend to fill very quickly. There is also a car park on Kinnoull Street which is operated by Smart Parking Car Parks (01738 440 933). This 550-space multi-storey car park is open from 7am - midnight Monday to Saturday and 10am - midnight on Sundays. It is a pay-and-display car park meaning that the charge must be paid on arrival. A height restriction for this car park is also in place: approximately two metres (six-and-a-half feet). Vehicles higher than this should park in South Inch car park where there's no height restriction. At Perth Concert Hall we have an Induction Loop in the Gannochy Auditorium which is in use for most performances; just turn your hearing aid to ?t' position. For those who do not have a hearing aid, we can offer Infra-Red headsets to allow user to hear enhanced sound from the stage. At Perth Theatre we have FM Headsets which can be collected from either the Box Office on arrival or from a member of the FOH team. These headsets are used instead of a hearing aid to receive enhanced sound from stage. All guide, hearing and assistance dogs are welcome in both our buildings. 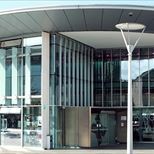 Perth Concert Hall and Perth Theatre have been designed to be disability friendly. We have lifts to all levels, Induction Loops, FM Headsets, Infra-Red Enhanced Hearing System and staff who are happy to help.